The Analytical Laboratory Drawer (ALD) – the rover's onboard laboratory, where soil samples acquired with the drill from the Mars soil will be processed and analysed – was the focus of recent testing activities at Thales Alenia Space, Turin, Italy. Seen here is the ALD qualification model entering the test chamber. This six-week long test period is part of the ALD qualification process, whereby the functionality of the thermal control system, cleanliness requirements, scientific instruments and sample processing mechanisms are verified. 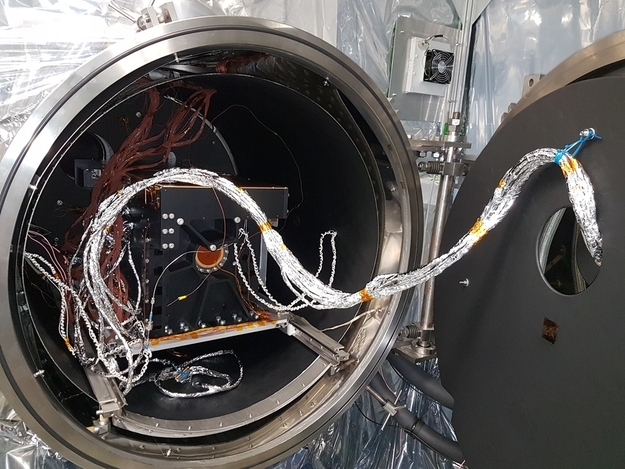 The test used Mars analogue samples and took place under simulated Mars environment conditions – a low pressure, carbon dioxide atmosphere and a range of temperatures from -50°C to +50°C.